Dollarman is a force straight out of Brooklyn known for his dynamically gritty voice and innovative rhyme flow. He has been capturing his audience in a lyrical groove packed with rhythms and rhymes for over 15 years. 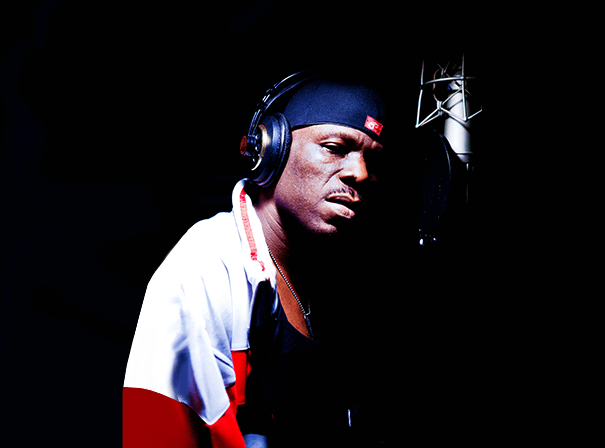 Dollarman is the featured Dancehall artist on ‘Rock This Party (Everybody Dance Now)’ produced by Bob Sinclar and the track went to number one on the Billboard Dance Chart in five weeks and won Dollarman a gold record for his vocals. The track also features Cutee B and Big Ali and samples the massive 90s hit ‘Gonna Make You Sweat’ by C+C Music Factory featuring Freedom Williams. Other hits of his that have hit the charts include ‘Sounds of Freedom’ and Dollarman also collaborated with Big Ali on the remake of ‘I’ve got the Power (Snap)’ called Big Ali feat. Dollarman ‘Hit the Floor’ which went to number one in Germany. He has graced stages all over the world from the Hamptons to England. Dollarman is a talented songwriter, artist and producer. He has a dynamic stage presence and stellar performances. He is featured on the ‘Money’ track of the Reggae/Dub version of Pink Floyd’s album Dark Side of the Moon cleverly titled Dub Side of the Moon. The album’s success was accompanied by a UK tour as well as performances at Reggae on the River in California and a Midwest tour with the Easy Star All-Stars. Dollarman appears on Reggae legend Half Pint’s studio album Past to Present. The song entitled ‘Babylon Release The Chains’ is one of the premiere tracks on the album and shows off his talent as a writer and DJ. Dollarman has performed on a live radio and internet broadcast produced by one of the France’s biggest radio station, Fun Radio and Universal France and is a regular performer at big events around the world with new house releases coming on Network Records.